Salvatore Ferragamo Incanto Bliss | Scent Addicts - Perfume reviews, fragrance news, & more! 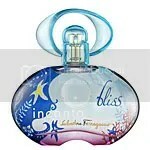 Other than stuck up, biased, ignorant perfume snobs – who doesn’t love the Incanto bottles? They’re beautiful, feminine, lovely additions to any fragrance lover’s collection. Does the juice justify the purchase of the newest Incanto creation beyond adding a pretty bottle to your vanity top? In my opinion, no. But perhaps the smell of strong, slightly musky, even slighter femininity (the best way I can describe this scent) will appeal more to your nose than it did to mine. I wanted to love Bliss. I really wanted to love Bliss. My nose goes through many an emotion throughout the various stages of Bliss. First, there’s the slightly odd smell of the fresh spray onto the wrist. It’s a bit strong when it’s still settling in (and for the hundredth time, I’m an extremely sparing sprayer), and the oddness is indescribable other than that it’s unique, and not very “young.” Keep in mind that “odd” does not necessarily mean bad. It’s just unlike any other scent (at this point in the dry down) than I have ever encountered. Once the fragrance actually dries on the wrist, it’s extremely enjoyable (for me, at least). It’s a concoction comprised of floral goodness and sweet citrus hints, but not so much that I would consider this to be anywhere close to a fruity fragrance (despite seeming so, according to the notes). This blissful aroma does not last long, though. Once the fragrance has gone through all of it’s settling stages, the end result – for me – is undesirable. That is what I get from Incanto Bliss. The scent is not bad. It’s just not for me. It’s a very “old,” slightly nostalgic smell, but it is not mature. It is not unpleasant, but it is neither, once dried down, fresh nor fruity nor spicy.. the best classification of it is certainly floral, but that is not to say that this is a richly floral fragrance. I myself am an avid fan of floral scents, but this one certainly won’t be appearing on my Christmas list. Samplers, beware. Perhaps you will indeed enjoy this scent throughout it’s stages and determine it purchase-worthy. Congratulations on your new perfume baby, if that is the case. Do, however, keep in mind that throughout this perfume’s several stages I went from feelings of mediocrity to absolute adoration to apathy. Be sure to let this sink in before you make a decision in either direction. Definitely unique. If you’re looking for a nostalgic scent or just something out of the ordinary, this may be the one for you. This is not a sweet, or fruity, perfume, and is also not entirely floral, but is best described as such.